Our CSA’s ginormous bags of greens combined with the eternally delicious stash of lettuce from our own garden, has equalled to some truly crunchy and satisfying meals. Greens go in smoothies (good enough for green lantern! ), on eggs, in eggs, sautéed, and my personal favorite: Ground up to a delicious paste and spread on pizza. While Rowan isn’t as easily convinced that sautéed beet greens are the best thing since sliced bread, Miles is quite excited to stuff his little mouth with anything green, be it spicy, crunchy, or as earthy as can be. And truth be told, on the long wagon ride back from the CSA farm (it is uphill both ways if you didn’t know), I have caught Rowan happily, absent-mindedly, munching on everything from fennel tops to dinosaur Kale. It makes my heart soar. Last night after knocking the towering mason jar of fennel tops over for the millionth time in my refrigerators side door, I felt it was time to use those silky fronds. 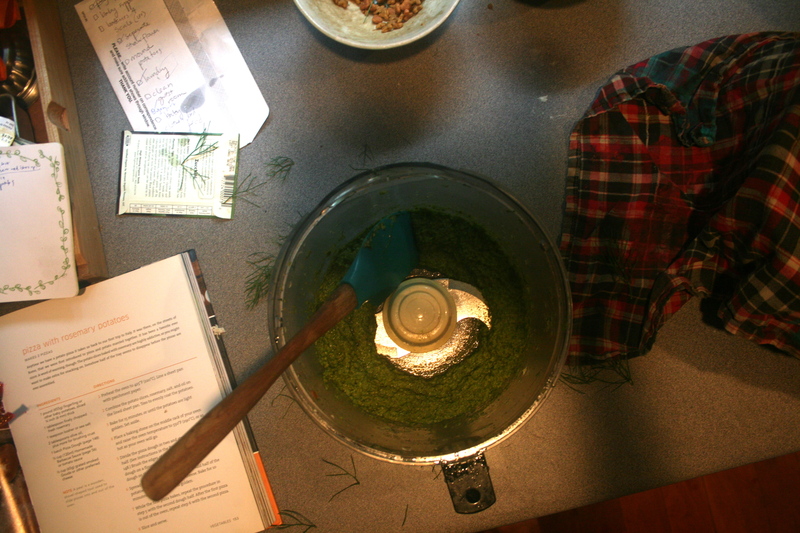 So I plopped them in the food processor with a dozen garlic scapes, a handful of basil, a touch of mint, some freshly toasted pecans and a very generous pour (or two or three) of olive oil. Salt, pepper and a fine grating of romano and oh yes I was feeling pizza for supper. It’s only right when you create something so impossibly green to devour it with the ever sought after fresh mozzarella and some goat cheese, mountains of caramelized onions, and sautéed, crispy early zucchini and summer squash. Toppings of an early summer harvest, you just can’t beat em. 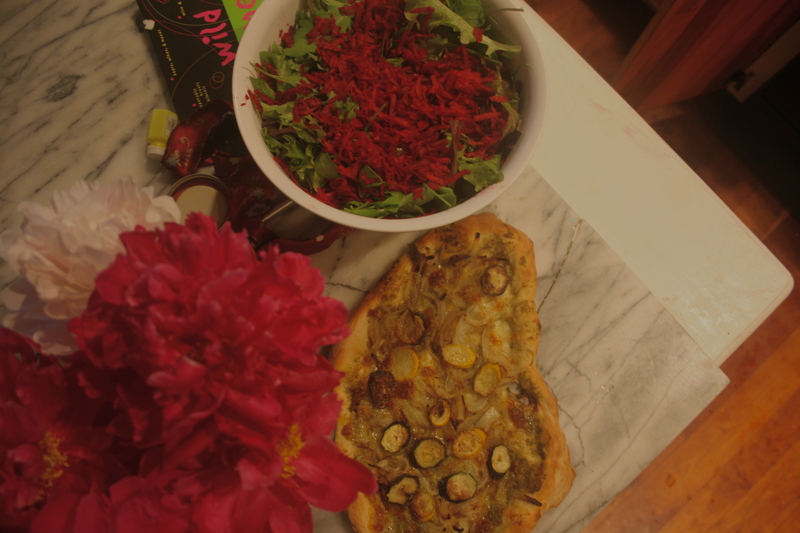 This entry was posted in food and tagged csa, early summer harvest, fennel fronds, fennel tops, gardening, garlic scape pesto, garlic scapes, pesto pizza, vegetable gardening. Bookmark the permalink. Very nutritious and beautiful. I have to laugh at myself…I looked at the first picture for a while, wondering why there was a can lid inside your mixing bowl.. I finally realized I was looking down in a food processor. Oh that does look good. Somehow oblong homemade pizza’s are just plain prettier. Be well.